Artist Richard Kuöhl (1880-1961) sculpted these two bronze figures. 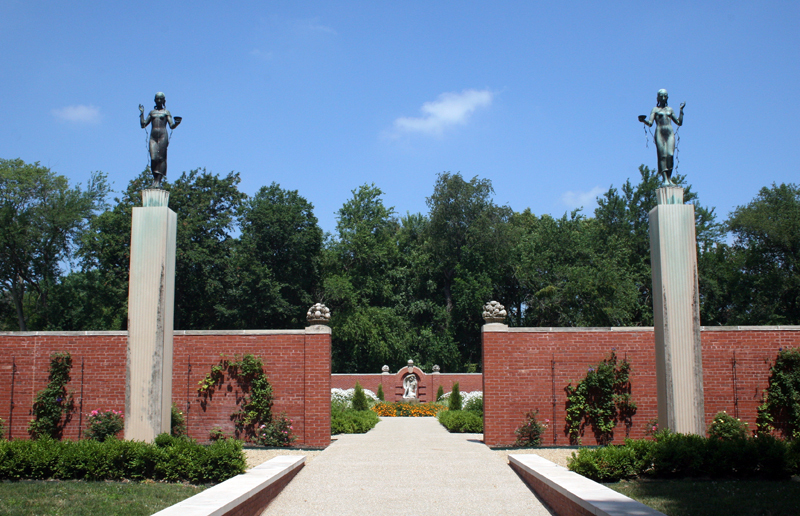 At 6' high, the sculpture flank the path to Brick Wall Garden in Allerton Park. The artworks were a gift of Robert Allerton in 1946. The placement of Kuöhl's darkly patinated bronze figures at either side of a gravel pathway leading to the Brick Garden nicely relates them to the meditative Girl with a Scarf just beyond. In Art Deco style, they are mounted frontally on John Allerton's tall white fluted square columns. 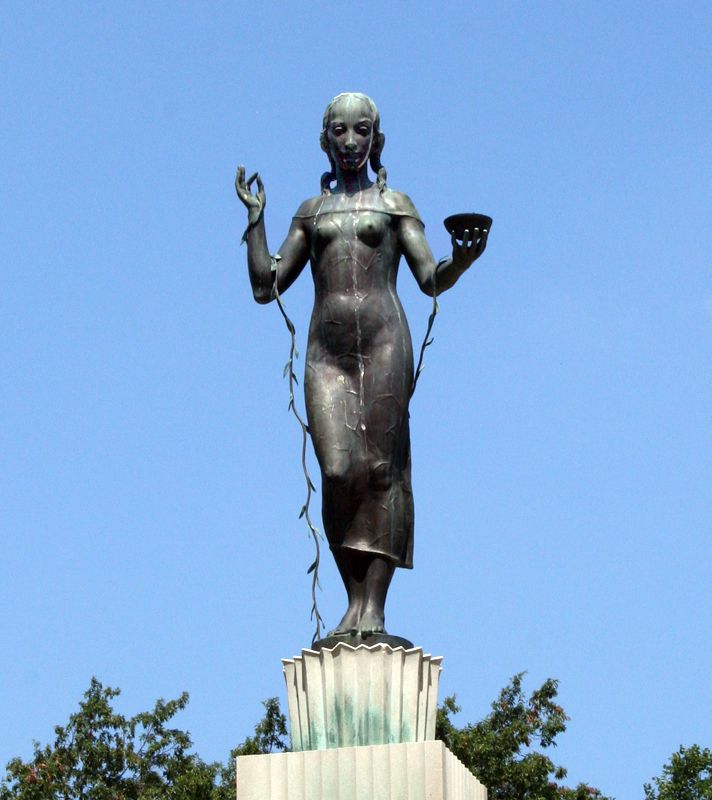 Allerton commissioned the statues after seeing a similar figure done by Kuöhl in Hamburg to advertise the Hamburg-American Line, a passenger-ship company. That figure stood atop a kiosk and held a Viking longboat, but Allerton had the artist change the accessory to a bowl of plenty, more in keeping with the spirit of the sculptures' midwestern prairie destination. At first the patron thought also of having a pair, male and female, and asked the artist to work up a masculine counterpart to the kiosk woman. But, John Allerton recalled, his father turned down the proposed mate as "too static and without the grace and charm of the female." Mirror images of each other, the maidens' lithe, pubescent bodies show under transparent drapery, their watery origins suggested by seaweed-embossed embroidery and ropey seaweed garlands. John Allerton wondered whether the male was ever made, and described other Kuöhl work: "We have here [in Hawaii] two small figures cast in 'clinker,' which is red terra cotta really. They were left over from a building in Hamburg called Chile Haus. l also have two bronzes of a mermaid riding a fish, also 'right and left' figures. Oh yes, and still more, ones he had done for a bank and were part of four window grilles. No wonder Kuöhl never became famous because we have so many of his creations hidden away." 515 Old Timber Rd, Monticello, IL 61856 ~ This sculpture can be found on the path to Brick Wall Garden in Allerton Park. Muriel Scheinman, “Sea Maidens, 1930,” ExploreCU, accessed April 19, 2019, https://explorecu.org/items/show/45.